A series of two Solid Waste Management Exposure Workshops were facilitated by Feedback Foundation at Chandigarh from 29th – 31st October, 2018 for Urban Local Bodies (ULBs) from 13 districts of Punjab and Chandigarh UT, and from 1st – 3rd November, 2018 for ULBs of 19 Districts of Punjab. These workshops are organized by National Institute of Urban Affairs (NIUA), with support from the Ministry of Housing and Urban Affairs, GoI, with the objective of enabling the ULBs to recognize the issues in Solid Waste Management, understand relevant rules and policies and implement effective solutions prior to Swachh Survekshan 2019. 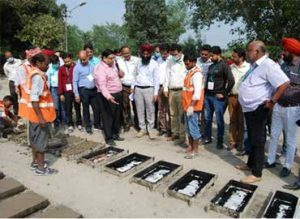 The workshop included technical sessions and field visits of Solid Waste Management Sites in and around Chandigarh to demonstrate waste management technologies.